’Tis but a stroll now, to our final destination. We leave Ceres, using ancient rights of way, heading for Callange [where Señor Lunardi landed with his hydrogen-filled balloon, having completed Scotland’s ‘first aerial voyage’ in his 46 mile flight from Heriot’s Hospital in Edinburgh. Over Kininmonth Hill we start our slow descent to the coast. 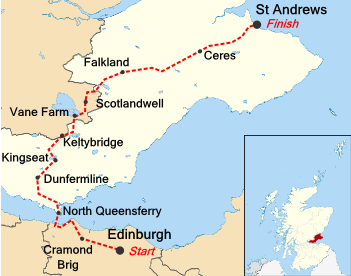 We pass the village of Denhead, circumnavigate a golf course and Craigton Country Park, before heading down the Den [valley], which becomes Lumbo Den then the Lade Braes Walk - constructed over a mill lade, carrying water from the Kinness Burn which originally fed the religious precincts of St Andrews Cathedral, which we reach after strolling past shops in South Street.